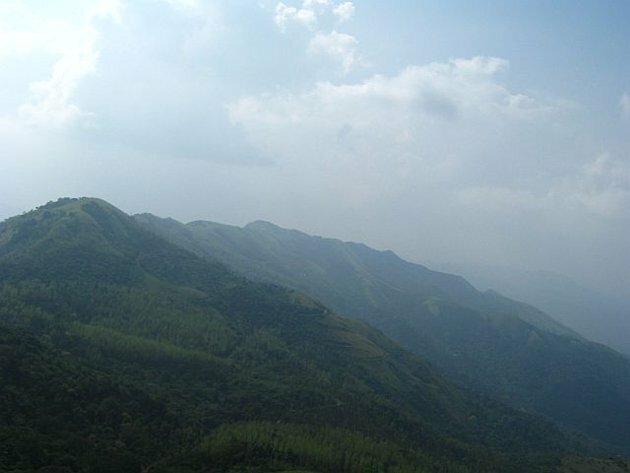 Karnataka boasts of some of the most beautiful ranges of the Western Ghats one can ever hope to visit. It shelters so many must-visit places that it is hard to cover all of them in one go. Inspired solely by a book I’d read about the Sahyadris, I set off on a three-day trip with my family to explore these hills. We chose to stay in Chikmagalur at the highly recommended Thippanahalli Homestay, a heritage mansion straight out of a picture book. The mansion sits in the middle of an enormous coffee estate and belongs to one of the oldest coffee-growing families in the area. We were received warmly and simply into the rather overwhelming bungalow. Our room overlooked the dense plantation, into which we wandered off early the next morning. 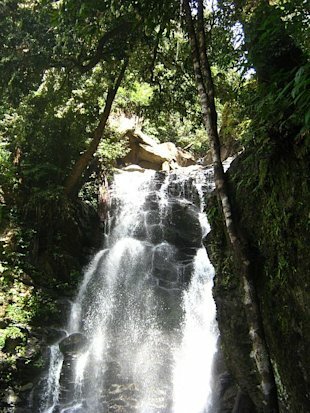 Trekking routes wind through the estate and are fringed by unusual flowers and gurgling waterfalls. The homestay surely lived up to its rave reviews! After a lovely breakfast in the company of a giant lizard peacefully sunbathing on the window sill, we drove to Mullayanagiri, the highest peak of the Western Ghats of Karnataka. The 200 steps are not as daunting as they look — the cows have already got there and pleasantly make way for climbers. 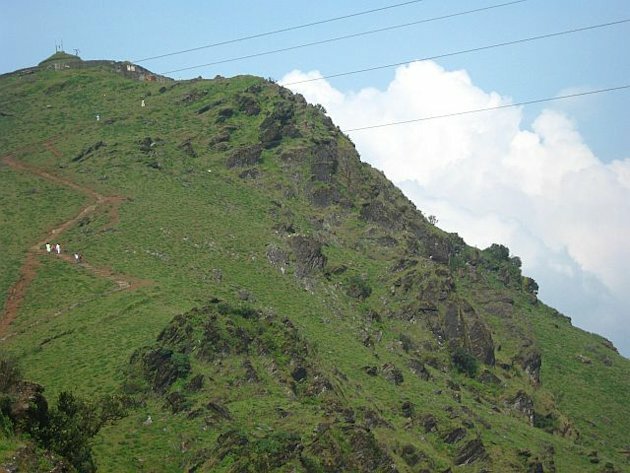 The peak offers a gorgeous view of the Baba Budangiri Hills. A Shiva temple is built atop the mountain and a Nandi sits beside it prettily in an open hut. We had planned to go to Kemmangundi the next day. However, upon my mention of Kudremukh, our driver jumped with enthusiasm. And so, with a couple of calls to the Forest Officer for permission, we visited this gorgeous National Park the following morning. A guide escorted us inside the park, which even offers a few basic huts for those who want to stay overnight. The Lakya Dam is one of the most beautiful places I have ever seen. 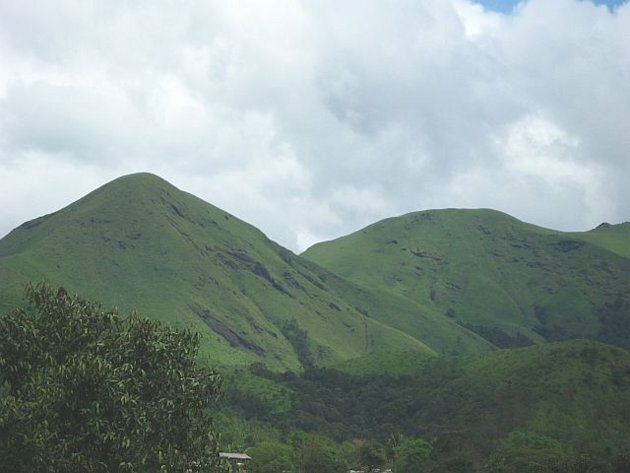 It is placed against a backdrop of velveteen green slopes of shola that look curiously tangible and frustratingly inaccessible. Photography isn’t allowed here and I doubt words can do justice to this place. Kudremukh was much larger than I expected. 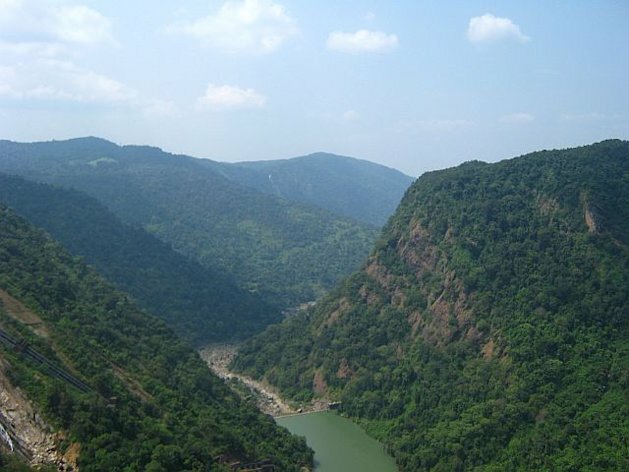 We stopped briefly at the Kadambi Falls and moved on to the Hanumangundi Falls, which is tucked away inside the forest. The walk to the waterfall was interesting as an assortment of insects and birds made themselves heard and, the more curious ones, seen. Our guide then told us that he would take us to Gangamoola to see the origin of the Tunga River, which joins the Bhadra River to form the mighty Tungabhadra. He led us through an offbeat narrow path. We walked through the light green grass towards a dense dark clump of trees. 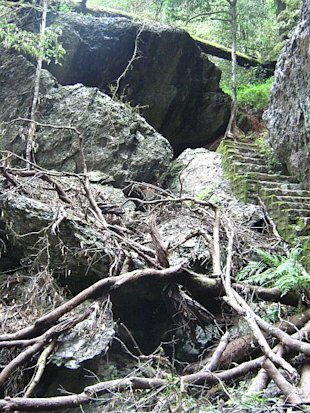 Dodging fallen trees and enormous roots, and stepping on slippery moss-covered rocks, we reached a small cave. The guide pointed to a piece of rock and announced our arrival. Peeping beneath it, we could see dark water bubbling out, icy-cold to touch. It is true that some great things have small beginnings. We drove out of the park towards Sringeri, the famous temple built by Adi Sankaracharya. 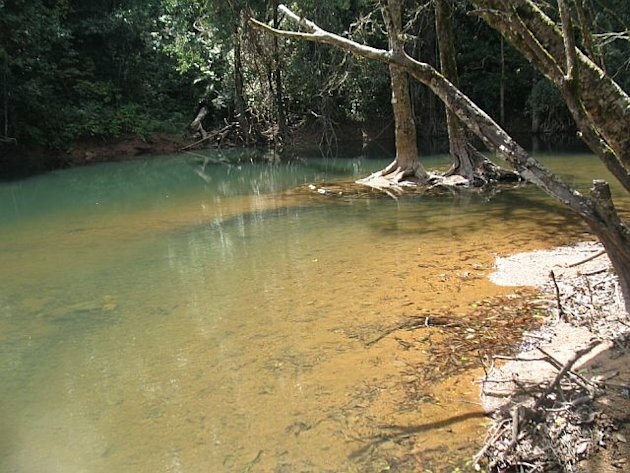 I sat on the steps on the banks of the Tunga River and impulsively dipped my feet into it. To my alarm, I felt something rub against them, and looked down to find that the entire river was full of enormous fish (the popular sport fish mahseer) which the devotees at the temple regularly feed. We drove back to Chikmagalur through evening rain that is characteristic of the Ghats, digesting the experiences of the day in silence. 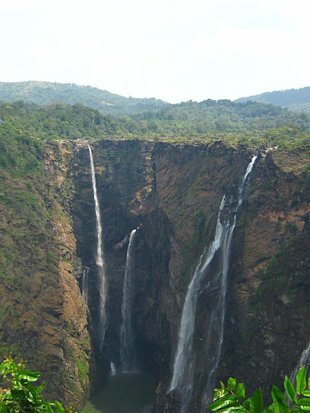 When we told our host we were going to see the Jog Falls the next day, she was sceptical about it being the right time to visit. However, we stuck to the itinerary. On the way, we stopped under a large tree to have breakfast. 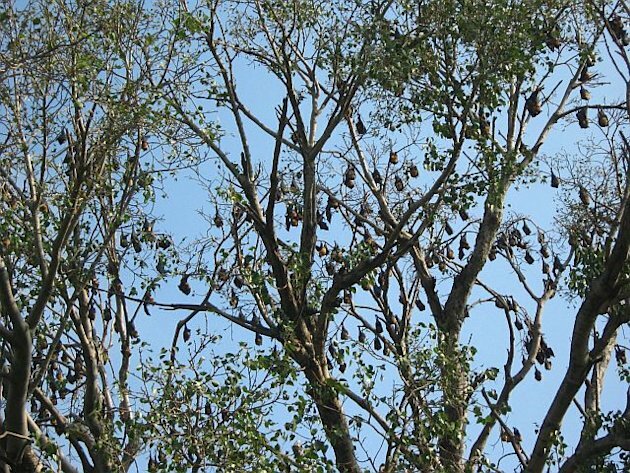 Hearing some strange noises, we looked up to find (much to my mother’s horror) a large number of fruit bats partying out in the morning sun. The five-hour drive to Shimoga was tiring. Since it was just after monsoon season, we expected to see the roaring waterfalls of screensaver fame, but we were greeted with something less spectacular. Apparently we were too late (October) to catch the falls in their full form. But an enormous and gorgeous rainbow on our way back made up for our disappointment. The following day, just before we left the estate, I caught a glimpse of a Malabar giant squirrel disappearing swiftly into the trees. That was the icing on the cake. It reminded me of the glorious diversity of life that these mountains protect and nurture — its people, the many animals, trees and exotic species — the well-explored, the familiar, the unseen and the unknown. 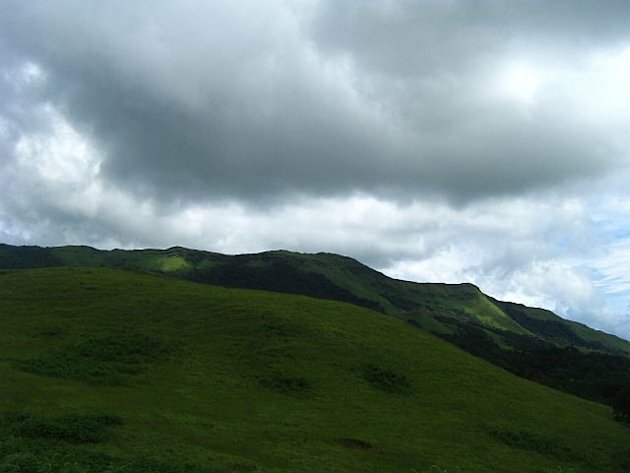 Tags:chikmagalur, karnataka, published, travel writing, Western Ghats, Yahoo!